Here at Picnic Furniture, we offer 4-row commercial quality bleachers that provide comfortable crowd seating for outdoor events. Our bleachers are crafted out of heavy-duty anodized aluminum that is crack, peel, and UV ray resistant while giving a rich metallic appearance. For easy movement around your venue, some of our 4-row bleachers are offered with a convenient tip and roll option with our 4-row bleachers. 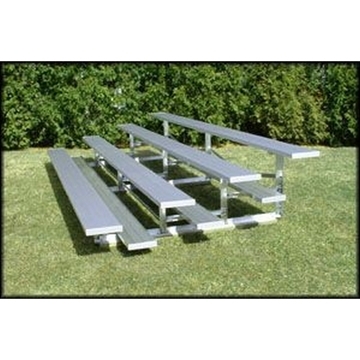 These bleachers can be found at schools, universities, parks, and sporting fields nationwide. Call or chat with our friendly staff today for a personalized quote.